Dive Into Your Imagination~ Who Lives in the Sea? 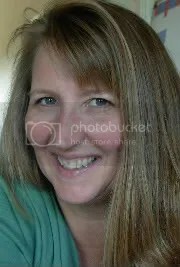 Let me introduce you to a new friend of ours, Annie Crawley of Dive Into Your Imagination. Annie Crawley is on a mission. She’s on a mission to share the beauty and wonder of the REAL world. She knows that we protect what we love, and as an underwater photographer, dive instructor, and boat captain for more than 15 years, she wants children and their parents to fall in love with the ocean, and the magnificent animals of the sea. Because if we fall in love with the ocean, we will protect the ocean. Driven by her mission, she has created an amazing series of educational and entertaining dvds that kids of all ages will enjoy. She has also created Educational Guides currently for PreK-3rd grade to use as a unit study with the dvds. We also received access to download PDF Educators Guides in grade levels Pre-K-K or 1-3 which were created to accompany the dvds. The guides are available on Annie Crawley . com as a printed version for $299 (for the set) or as individual PDFs for $69.95. As a special for the Homeschool Crew and The Old Schoolhouse Magazine and followers Annie Crawley of Dive Into Your Imagination will gift you a set of PDFs with purchase of the DVDs. When you place your DVD order, just let her know in the notes that you are a Homeschool Parent! I was curious how the two levels differed , so I downloaded both Pre-K-K and 1-3 guides for Who Lives In the Sea? The Educators Guides are HUGE. The Pre-K-K guide is 306 pages while the 1-3 guide is 347. The cross-curricular lessons are designed to bring science together with Art, Language Arts, Geography, Math, Music, Social Studies, Movement, Teamwork,Collaboration, Character Building Skills, Imagination Play and more. In the homeschool world we call these Unit Studies :). * Character education and imagination play for your students. * A set of student questions correlating to the lessons designed to prompt discussion and enhance learning during video and multi-media viewing. * Ideas and support materials you can use to build learning centers in your “classroom” which combine science with other core subjects. * A glossary of scientific terms, eco-tips and websites for educator content support. * Suggested book lists and extension activities that can be used to bring an ocean of imagination flooding into your “class”. ~While this guide is designed for classroom use, we found it to be easily adaptable to homeschool use and individual instruction. Of course, homeschoolers are famous and simply fabulous at tweaking things, and we really love unit studies. The organization and layout of the guide is awesome. It includes cute character scuba divers Ocean Annie and Makaio which “guide” you through the pages with some great activity,vocabulary and color pages for printing (same for both levels of guides), as well as amazingly creative activities, games, songs, projects, notebooking pages, cut-outs, discussions, you-name-it. It’s got some really cute animations, as well as a little bit of beautiful photography. This puppy is just packed FULL. We already love and protect the sea. My hubby is a certified diver, and the dive medic for the Army National Guard Dive team. He has ordered materials to have the kids dive certified when they are all old enough and they have really enjoyed going through the materials and learning about scuba diving. My almost 12 year old wants to be a marine biologist, and has been through her Swimming Creatures zoology study for three years in a row. 🙂 She LOVES the sea and can’t wait to be dive certified. She reads our aquarium newsletter cover to cover when we get it, and gets email/newsletters from the Save our Seas foundation (which Annie mentions on the dvds) as well as perusing their website often. 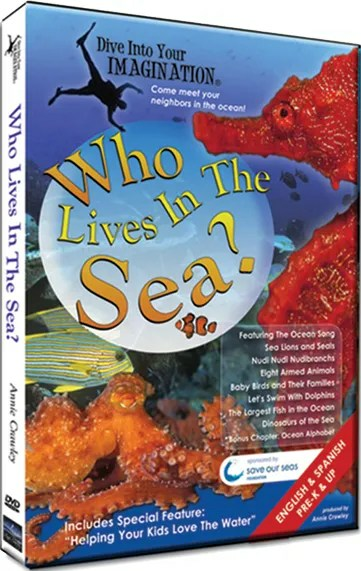 My 6 year old has been through the scuba diving dvd over and over again, and can tell you many little known facts about the sea and scuba diving. I would have to call Annie’s mission of helping kids to love the ocean a success! (Or at least they sure LOVE these dvds!) Levi sings the songs he has learned from the dvd over and over and over again too! We will be ordering the rest of the series of dvds soon. My daughter also has her eye on the underwater photography dvd over on the Dive Into Your Imagination website. To see what my Crew Mates thought of this and other Dive Into Your Imagination DVDs, visit the Crew Blog! Come along with us, and dive into your imagination! *Disclaimer: I received these products as a member of the TOS Homeschool Crew for review purposes. No other compensation was received and opinions are my own. Categories: TOS Crew Reviews 11 12 | Tags: childrens videos, educational unit studies, kids scuba diving, Ocean unit study, scuba diving | Permalink. The mission of Heritage History is to make old-fashioned history books, written for the enjoyment of young people, easily available. 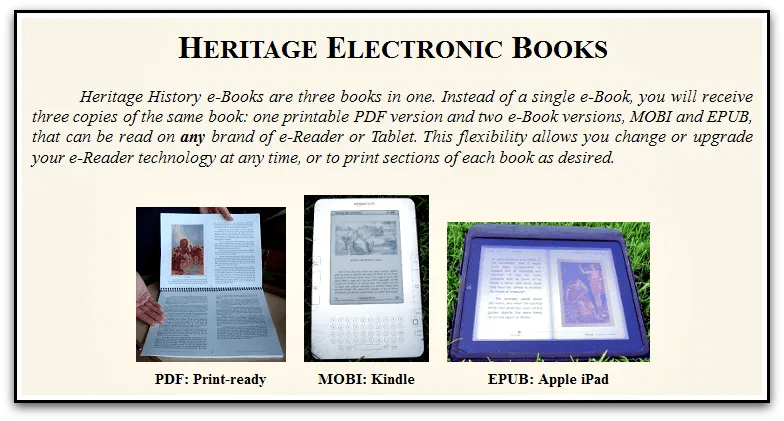 The complete text of every book in their library can be read directly off the website, and both printable and e-Reader formats are available at the Heritage Store. They originally organized these amazing collections of living books as library collections, but then they added a wonderful study guide so that each curriculum CD can be used as a stand alone curriculum. Each curriculum cd includes biographies, legends, hero stories, and historical literature as well as comprehensive histories. In addition to books, study aids, including timelines, historical maps, and era summaries are provided in printable format. The study guides are extremely complete, outlining tons of options for study at introductory, intermediate, and advanced levels. ~Introductory histories are color coded green and are “chapter book” fourth grade level. ~Intermediate histories are color coded brown and are longer and more advanced for middle school level students. ~Advanced histories are color coded red and are accessible to college-prep high schoolers or “moderately sophisticated” adults. *None of the histories are analytical, making them accessible to anyone with an interest in the subject. For review we requested Ancient Rome to complement our study of Latin, and help us prepare better for the National Latin Exam. 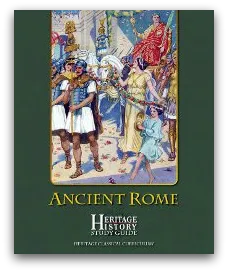 While my high school student has studied a year of Ancient Rome already, I see many of the books here are ones used in the living books curriculum we used. Some of these books we already have in our collection from her studies, but there are many more that will be of great use when my other two students are ready to study this era. to older students. Stories from Gothic, Carthaginian, and Byzantine history are also included. Curriculum CD includes 45 books, 60+ maps, teaching aids, and a ready to print Study Guide for $24.99. The Printed Color Study Guide can also be purchased separately (it’s the same as the one on the CD, but includes binder covers) for $24.99. I really want to start out here saying I feel a huge inadequacy describing all this curriculum has to offer. I was blown away by the sheer amount of material, options, pathways, and possibilities that this curriculum has to offer. To begin with, I just can’t believe the price for such a library alone. I don’t tend to comment on price very often because everyone has such extreme differences in opinions of value and budgets available, but this curriculum is just amazing for the price. And adding the superb and multi-age inclusive study materials with it totally doubles the value. So there you have it on value and cost. But where to begin on explaining this…I’m kind of at a loss. It’s really the ultimate living books, extra study aids included program. My middle school student was absolutely thrilled to find their collection of ancient Rome maps. There are many different ones, from different sources, and this is something we had to try and pull together from several different sources when studying for the National Latin Exam this year. This curriculum complements our current favorite history program so very well. I really love that the kids can just open up their student notebook and follow along with some extra commentary, timeline, and maps to visualize what they are studying. It’s all right there. This curriculum CD has added so many more resources to choose from to our studies. While we won’t ever use every one of them, we have so much to choose from that I feel we will always have just what we need at just the levels we are at. And when an interest strikes to learn more, read further, research a bit more, well, there will be nothing to stop them from continuing the journey as far as they wish to go. I’m pretty excited about adding a few more CD’s to our collection for next year. This came at just the right time while I was beginning to locate history resources for next year!! Thank You Heritage History!! 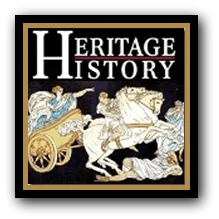 And if that’s not enough, at the time of this review post Heritage History is offering a Spring Curriculum Sale! If you purchase two curriculum CDs you get a third free! 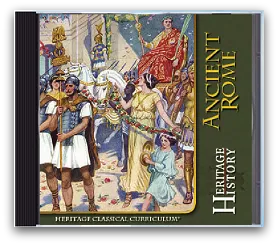 You can also enter a drawing to win a Kindle Fire with your choice of any Heritage Classical Curriculum CD! My Crew Mates reviewed a wide variety of Heritage History curriculum, so be sure to check out some other adventures over at the Crew Blog! * Disclaimer~ I received the Curriculum CD and printed study guide combination as a member of the TOS Homeschool Crew for review purposes. No other compensation was received and opinions are my own. Categories: TOS Crew Reviews 11 12 | Tags: Ancient Rome, Living Books History | Permalink. If you share my dilemma in trying to find things that will interest a school-phobic kindergartener who would rather ride his bike all day, I have a really awesome program for your consideration. Or, if your little scholar is more like my first two students who couldn’t wait to “do school”, then they will be super-excited about this as well. I know, Write Shop doesn’t sound like it would be a very exciting adventure for a schoolphobe. But what’s inside, well, it might just be the ticket to a whole new perspective. 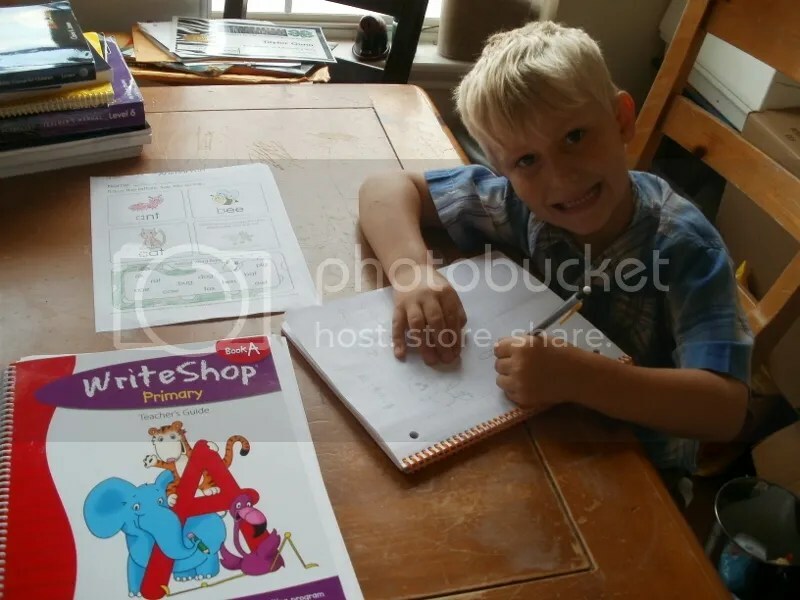 Write Shop Primary was designed for grades K-3. 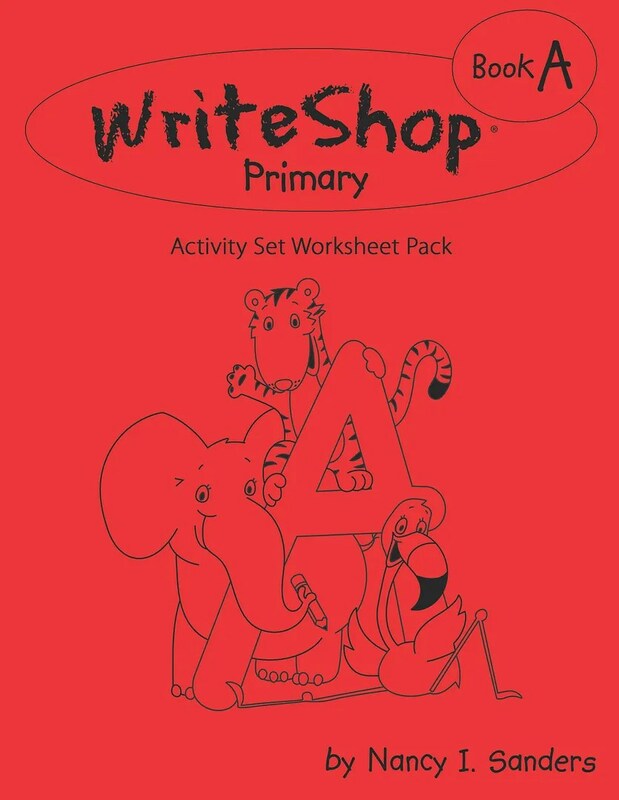 It consists of three levels A, B, and C.
For review we received the print version of Write Shop Primary Book A recommended for students in kindergarten or first grade, and the coordinating Activity Set Worksheet Pack. 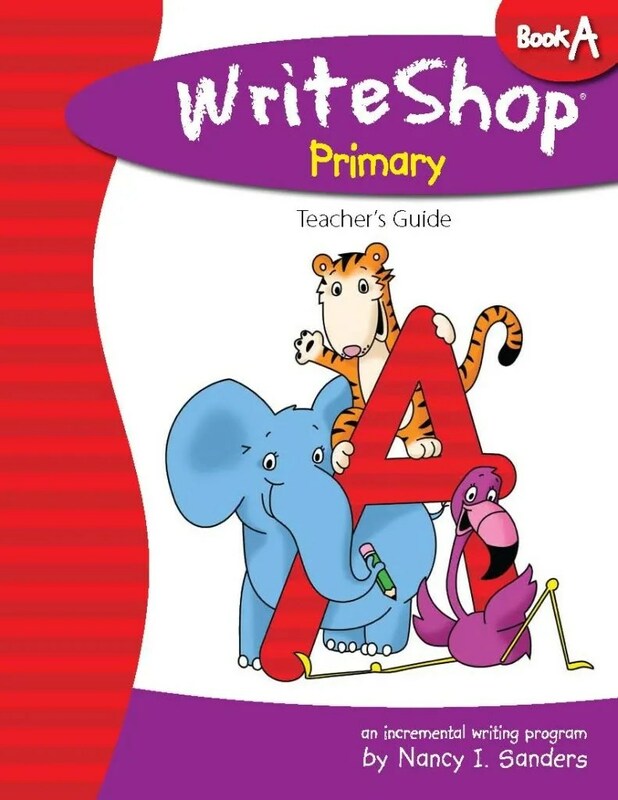 The print version of Write Shop Primary Book A retails for $26.95 plus shipping, or can be purchased as a PDF ebook for $24.95. 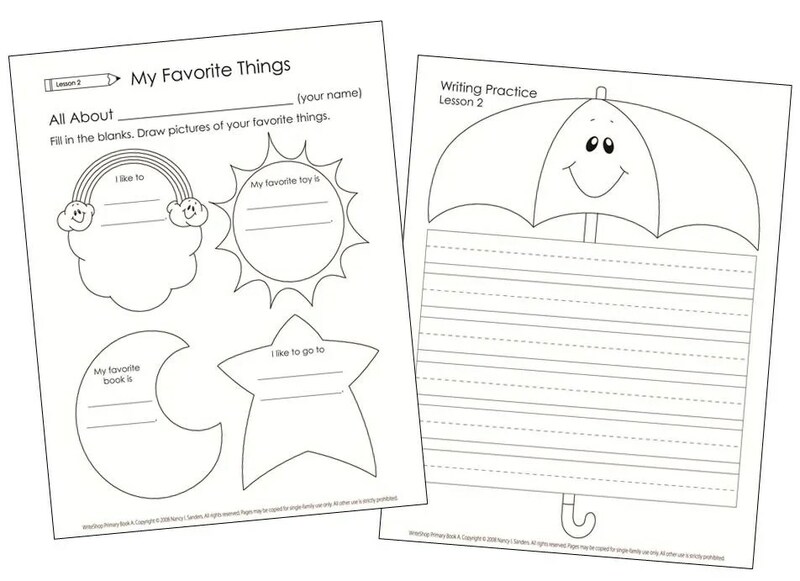 The Activity Set Worksheet Pack in print form can be purchased from the website for $4.95. Levi has really enjoyed this program. 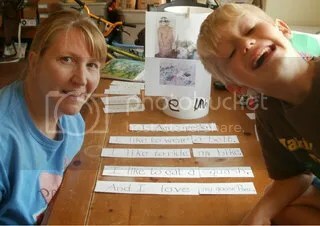 It has taken the pressure off of him to read and write, and just allowed him to be creative. I’ll begin by saying this program is so well organized that my 11 year old is actually working through the lessons on days I’m working at the vet clinic. They are both always really excited to share with me what they did so we can discuss it together. No instruction or direction from me is at all necessary for her to implement the lessons with him. I love to hear and see what they did, and sometimes they just really get creative going above and beyond the basic lesson. Taylor has always had a way to get Levi excited about learning, projects, and activities. 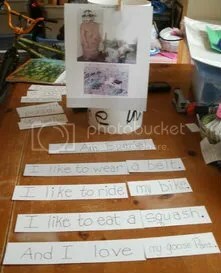 She has been making him little books, worksheets, and projects from the time he was super little and called it “Baby School”. This is really an awesome extension of all that she started a few years ago for them both. Taylor has already asked if we can buy the other two books in the series so they can continue. This really just speaks volumes for this program in my opinion! After completing all 8 activities from Lesson 1, we moved on to Lesson 2: All About Me. The lesson focus here was personal writing, and the theme: I Am Special. The first couple of pages of the lessons always give an outline of objectives and materials needed for each section so you can easily prepare for the upcoming activities. ~There are ______people in my family. ~My phone number is _______. I was able to leave this in Levi’s binder notebook for he and Taylor to complete the lesson together. They practiced memorizing his address and phone number together. At the end of the last activity (8) in each lesson is a section called Want to Do More? where you’ll find lots of other activities for writing across the curriculum. In Lesson 2 the child was to pretend to be a certain animal, read a book or magazine or internet article to gain more facts, then do the writing project again describing what it would be like to be that animal. He was to recreate the paper plate project cover by drawing the animal. This went over extremely well in our animal-loving household!! On to Lesson 3 we went which was Choosing a Topic. The lesson focus was about thinking of ideas to write about, and the theme was My Favorite Things. The first thing we did required my advance prep. I made a portable word bank about seasons using a weather theme out of a manilla file folder. I really love that the advanced prep really can be put together pretty quickly. In this lesson we began writing more predictable sentences by repeating the same four sentence starters each day of the lesson. For each lesson we have also had an activity sheet to fill our from our activity sheet packet. 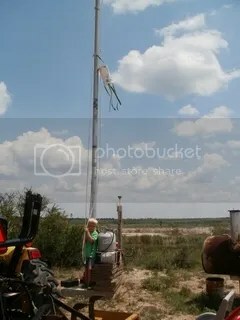 You can see the first one in the picture of Levi at the beginning of this post for an example. I hope you have enjoyed this glimpse of our first three WriteShop Primary Lessons. This program was truly an answer to prayer. Our kindergarten year has been a pretty rough start up to the last couple of months. But WriteShop has really changed things at our house! We’re moving right along through Lesson 4 learning about the main idea, focusing on selecting a title with the theme Friends. By the time we get to Lesson 10, I’m gonna have a budding writer on my hands! Next best thing, the price is totally affordable. WriteShop has products all the way through High School level too. Check ’em out! 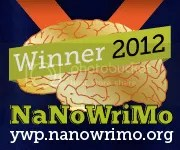 Visit our Crew Blog to read about my Crew Mates’ Write Shop adventures! *Disclaimer~ I received these books in exchange for an honest review as a Crew Mate on the TOS Homeschool Crew. No other compensation was received and opinions are my own. Categories: TOS Crew Reviews 11 12 | Tags: Hands-on writing projects, homeschool writing program, Primary Writing Program, stuff for kids who don't like school | Permalink. For over thirty years Library and Educational Services has been serving educators, churches, schools, libraries, and resellers with affordable wholesale products. Quality products can be found at 30% to 70% off, and even more at times. Often times these products are the latest, greatest ones out there on the market, and other times they are old favorites you might not find elsewhere. But whatever it is that you find among their amazing product selection, their customer service is always equally as excellent. I’ve ordered lots of great products and saved more money throughout the past few years than I can even count up at this point. I receive an email newsletter weekly with fabulous products, sales, new arrivals, one-time purchases, etc. You can choose to receive them less frequently as well as subscribing to specialty email newsletter customized to your preferences in products. I also receive an occasional print catalog with specials in my mailbox to browse through. I love their wishlist feature. If I’m not quite ready to order, I can save my selections on a wishlist for 180 days and just click “add to order” button when I’m ready to place my order. When I heard that the Crew was offered the opportunity to review some great DVD videos available on their website, I was delighted to find it was a set of science DVDs that I had my eye on over there already on my wish list! The list price for each Go Science DVD purchased individually is $14.95, but they are only $8.97 each at the time of this post. They list price for the 6 series set is $79.95, but they can be purchased for $47.95 at LES. So what’s this Go Science series all about anyway? With Levi’s new found love for science and experiments, I was happy to add these two Go Science DVD’s to our collection. These demonstrations are ones you wouldn’t typically do at home. Ben Roy speaks clearly and very excitedly about the topic at hand in short segments. They remind me of something you would see on Public Television or a Kid’s TV Network between programs. Levi enjoyed watching the experiments. Since they are divided into several short segments, he watched a few at a time then was ready to stop. 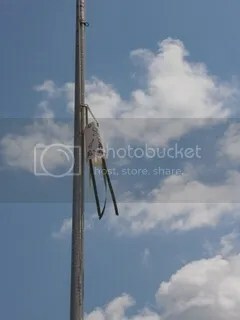 He enjoyed them more just watching a few at a time. They would make a really great addition to a kid’s Bible study or any group setting with kids. We have enjoyed watching them, and I really love being able to add these to my educational materials for Levi to watch independently while I’m working with the other kids. 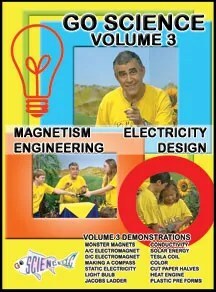 These DVD’s are definitely for the younger ages, as they don’t include very extensive or thorough explanation of the scientific side of the demonstration. My 11 year old wasn’t real interested in them herself, but did enjoy watching some of them with Levi. I’d probably recommend them for K-3 or so. They really are great for getting little scientist’s feet wet!! Be sure to check out my Crew Mates’ Go Science Adventures over at the Crew blog! Remember, every time we learn something about SCIENCE, we learn something about our CREATOR GOD! *Disclaimer~ I received two DVDs in exchange for an honest review as a Crew Mate on the TOS Homeschool Crew. No other compensation was received, and opinions are my own. Categories: TOS Crew Reviews 11 12 | Tags: elementary science, kids DVDs, Science, Science and the Bible | Permalink. Homeschool Library Builder~ Don’t Miss the GREAT May Sale!! They run some pretty great sales promotions alongside their already great prices. Last month they had some $1, $2, and $3 bins along with Nature books category being discounted. If you missed that because this is the first you’ve heard of them or just haven’t visited in a while, never fear! From May 1st all the way to May 31st, 2012 they have a whopping 25% off everything in the store! *No coupon code needed- discount will be taken at checkout. *Additional discounts or coupon CAN be used at the same time!! *The SAFEST way to ensure you get the items you want is to PURCHASE them before you leave the site. If you write in the comment box that you are still shopping, you will then have 7 days to FINISH your shopping. After 7 days the orders will be combined and shipping charges adjusted, and the order will be shipped. See what I mean? Go check it out, and I’m sure you’ll find some gear for your homeschool adventures. I know I have! While you’re there you can click over to FACEBOOK and LIKE them for additional promotions, sign up for future sales, and even find out how to advertise your products for FREE! Visit our Crew Blog for some great reviews of some great products! *Disclaimer~ No product was received. I’m just passing along some information about a great sale on a great website as a member of the TOS Homeschool Crew. Categories: TOS Crew Reviews 11 12 | Permalink. It’s pretty amazing to find a product that kids love and just want to keep watching and doing over and over. Especially when it’s educational, and school related. This year has been a bit of a challenge with a Kindergartener who would rather ride his bike and build forts all day than do anything he thinks is school. When we received Amazing Science to review, that all changed. 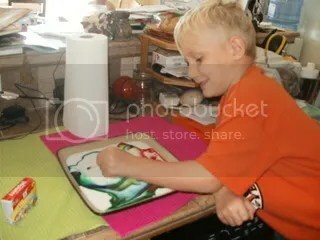 His interest in school and learning has been sparked by a friendly Rocket Scientist and some really cool experiments. Amazing Science! Volume 1 is one of the coolest things we have reviewed in the 4 years we’ve been cruising with the Crew. It’s more than amazing! 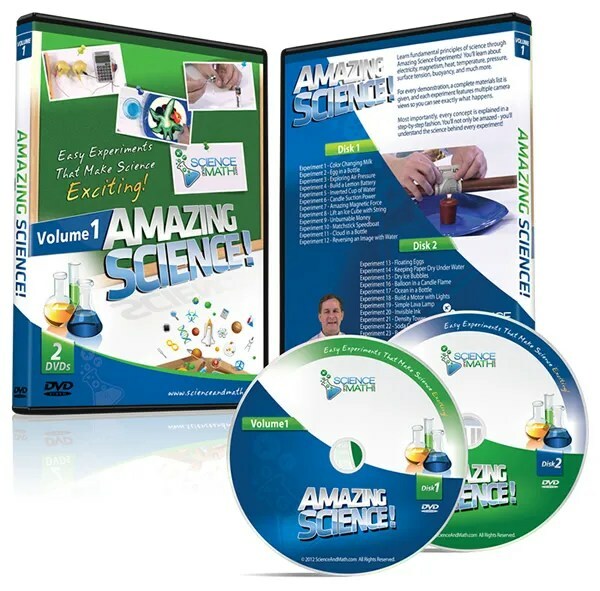 This two volume DVD set retails for $19.95 plus shipping, or can be downloaded for $17.99 for immediate use with no shipping charges at the ScienceandMath.com website. 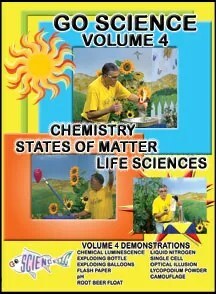 You can see a little video trailer there of Amazing Science!. They also have a whole bunch math dvds to check out. We have really had an amazing experience with this set of DVDs in so many ways. From it sparking my kindergartener’s interest, to seeing my kindergartener, middle-schooler, and high-schooler all working together, laughing and learning, this has brought some great adventures to our science-loving family. I have really been amazed that my 6 year old has sat and watched these experiments over and over again. He has walked around the house talking about air pressure, surface tension, magnetism, suction, buoyancy- wow! I’ve been amazed at his excitement to talk to his science- loving daddy (who has a BS in Biology and Chemistry and LOVES teaching his kids about science concepts) about what he has learned. 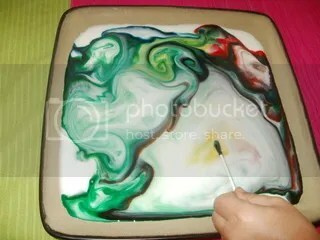 I have done several experiments with him including the very first one he couldn’t wait to do right away about color changing milk. We had everything needed for the experiment including milk (we used 2% milk instead of whole milk), food coloring, a cotton swab and dish soap. Levi actually repeated this experiment several times over. We then watched one of our home-grown chicken eggs be sucked down into a Starbucks bottle (after I volunteered to drink the contents ;)) and talked about the concepts that Mr. Gibson had talked about as he stood in front of his really-cool galaxy background on the DVD. We have lifted ice cubes from a glass of water with an ice cube and string and salt, kept paper dry under water, witnessed a dollar bill not catch on fire over a candle flame and watched a matchstick speedboat in a bowl of water with pepper and soap, among other experiments. 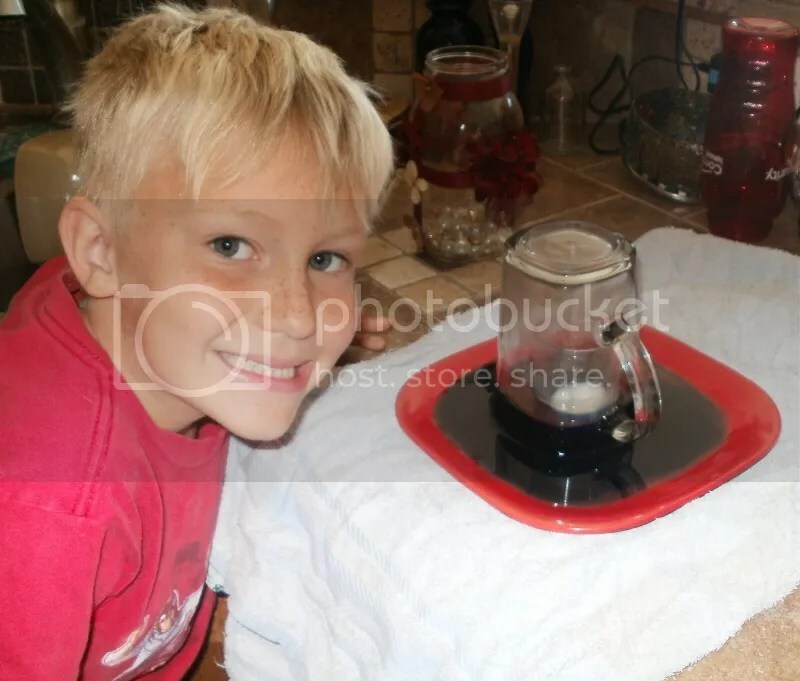 Here Levi got all the necessary materials to show me how a candle can suction colored water up into a glass. He explained that the candle flame used “air” to burn and once the glass was placed over the top, it used up all of “air” in the glass until the flame went out which made the blue water rise up in the glass. He was thrilled to see it actually happen right before his eyes! This has also been a super-great resource for my older girls to interact with and use with my 6 year old. They have done several experiments together without me, then explained what they learned. I’m amazed that Levi is still watching these DVDs over and over and still interested in doing the experiments, and repeating some that he’s already done. This is absolutely one of the coolest things we’ve had at our house to play with and learn in a while! Check out my Crew Mates’ Amazing Science adventures at the Crew Blog! *Disclaimer~ I received this DVD set in exchange for an honest review as a crew mate on the TOS Homeschool Crew. No other compensation was received, and opinions are my own. Categories: TOS Crew Reviews 11 12 | Tags: cool science experiments, Hands-on science, homeschool science, multi-age science | Permalink. We love classical subjects creatively taught! That’s why we love Classical Academic Press. This time we were blessed with one of their new line of Bible study programs, a historical, chronological study of God’s redemptive promises. These studies were designed to teach the “big picture” of God’s faithfulness to His people from a covenantal, reformed theological perspective, rooted in scripture. For review we received God’s Great Covenant, New Testament I. Through stories, worksheets, memory verses, quizzes, and a little boy named Simon from the village of Jareth, kids and adults can explore the Gospels and see how God fulfills His promises to His people. 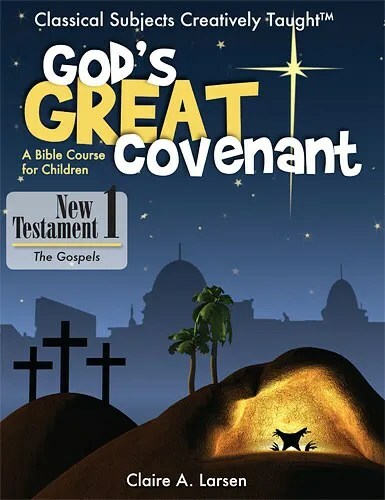 God’s Great Convenant, New Testament 1: A Bible Course for Children can be purchased for $26.95. It is targeted for 4th grade and up. This great little study is divided into 36 weekly chapters with 4 themed units. The Teacher’s Edition is a copy of the student text with answer keys and a whole lot of extra facts and information about geography, culture, history and theology to add to your discussion and learning of the New Testament. This amazing resource can be purchased on the website for $29.95. Visit the website to view some pdf samples of the pages! 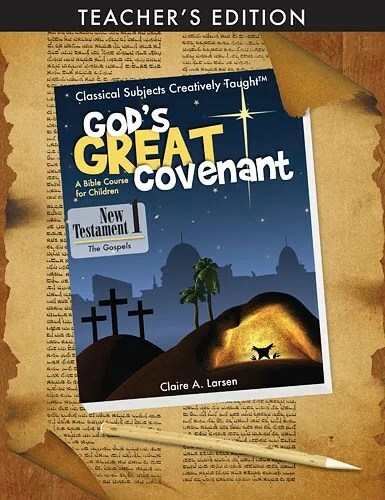 We also received an mp3 file download audio book of the readings featured in God’s Great Covenant: NT I. This retails for $9.95. This is just a wonderful resource for auditory learners, or to take on the road while traveling! CAP offers a bundle of the student book, teacher book, and audio book that is discounted 15% off of the individual prices making it just $56.95. I was super-excited to get this curriculum in the mail because we LOVE Classical Academic Press and are currently using their Latin Alive and Art of Argument. When we received the books, they were of the same superior quality as their other materials: glossy covers with thick , nicely organized, easy-to-read large font pages. When I opened the book to begin exploring, I was immediately blessed by the Introduction which explains the way this study of history is based on God’s Covenant, His promises, their fulfillment: not many covenants, but one covenant that unfolds through the years. To set the study in motion, the first part of the book gives a historical and political introduction, chronological introduction, geographical introduction, and religious introduction. Taylor thought this was just a little bit boring (except she really loves the maps!) as it was packed with facts and statistics and tables of comparisons and such, but we both felt it was necessary to provide a stage and a plot as we dove into Simon’s world. Once we started into the daily life introduction “Welcome to Simon’s World”, we both really loved how it is written in first person as ten year old Simon tells about himself, where he lives, what he wears and eats, his daily adventures, his house, his community, his views of the Romans and of the Messiah, his Grandfather’s stories, and life in Jareth. As we began to explore the first unit’s theme: Jesus, the Son of Man, is like us in every way, yet so very different, Taylor and I both agreed that the conversational style lessons and stories interwoven with worksheets, crossword puzzles, word searches, fill in the blanks, word games, devotional exercises, awesome maps, and super-cute graphics and pictures really give this study a “want-to” feel. It’s on the top of the pile. The first thing we are anxious to do when we sit down together with our stack of books. Opening our books feels like diving into a new adventure each time. I think this study will prove itself to be remembered. The presentation is practical. I think the students can relate to Simon sharing his story of how, when and where he lives, and his very human, ten-year-old feelings of Jesus and his perception of his world. Exploring the gospels with Simon, his parents and grandparents, his family and their day-to-day activities in the life and times of Jesus, is a great way to help kids relate to the Bible as more than just a story, but as real-life history. And this study is just packed full of real-live facts and promises, truths straight from God’s heart written down as scripture, in an easy to understand format just for kids (and adults too!). I also love that this study can be used for many ages. My 6 year old has listened in and has loved hearing about Simon’s world. The teacher’s book has a lot of extra references and facts to beef up the study and go way deeper as desired. It’s just an all around winner for families, and would be awesome for Bible study groups too. I definitely recommend checking out Classical Academic Press’s other resources if you’d like to add a classical flavor to your homeschooling! They have some really awesome stuff over there for learning languages, logic, Bible, poetry, and even a pretty cool website to supplement their studies called Headventure Land. You can find them on Facebook, and receive an email newsletter too. To read my Crew Mates’ adventures with God’s Great Covenant, visit the Crew Blog! *Disclaimer~ I received this product in exchange for an honest review as a member of the TOS Homeschool Crew. No other compensation was received and opinions are my own.